I chose to read Withering Heights by Dorothy Cannell because of the gorgeous artwork on the cover and because of the clever play on the name Wuthering Heights, although that book isn’t a favourite of mine by any means. The cover illustrations on Withering Heights are credited to Tim Zeltner and because I liked this cover so much, I Googled his work, (as you do). I’m actually quite taken with this artist’s very distinct style. Withering Heights is a fairly short book and would have been a fun read if there had been less going on. There are at least nine other books by this author featuring Ellie Haskell, the heroine of this book, so perhaps I should have started with The Thin Woman, which was the first book in this series. However, to sum up a complicated story, Ellie, who loves gothic romances, has a young relative, Ariel, who unexpectedly turns up on Ellie’s doorstep after running away from home. Ellie, her gorgeous husband and their housekeeper take the young runaway home and then stay on at Ariel’s parent’s home, Cragstone House, (aka Withering Heights), to solve a mystery which Ariel has begged them to investigate. Withering Heights would have been better if the story was simpler. There was too much happening and too many side-tracks and too many were too many characters saying and thinking clever things for me to keep everything in my head. I admit I have been a bit tired lately, (long hours at work which can’t be helped), but the funny things the characters said just seemed to get lost in everything that was going on. As a mystery, I really enjoyed the cover art on this book. 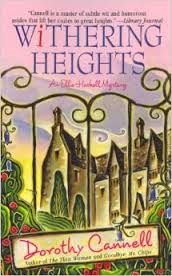 Withering Heights was a fun and light read but I won’t read another Ellie Haskell Mystery.